This is a shot, taken a few weeks ago, of one of several daffodil fields on my parents' property. All the daffodils are dead now, and the fields of yellow have been replaced by weeds and tall grass. It's kind of depressing, because the yellow fields are truly spectacular. However, you can still gaze out the window and see several acres of yellow. Yes, I'm talking about the Annual Buttercup and Dandelion Convention, which takes place every year, from spring through eternity and beyond, in our yard. Raise your hand if, as a kid, you picked a buttercup and held it under your friend's chin to see if she liked butter. (If you saw yellow under the chin, she liked butter. If you didn't, your friend probably wasn't Caucasian but may have liked butter anyway.) Raise your hand if you don't even know what a buttercup is. Raise your hand if you think a buttercup is kin to a peanut butter cup. Simon says raise your hand. You may now put your hands down. Buttercups and dandelions grow from nothing to three inches tall overnight. Then, when we cut the grass, which is approximately every day to keep up with it, the little yellow flowers fall to the ground...still yellow, still intact, and still everywhere. I suppose I should simply give up and embrace the buttercup as another beautiful flower, like the daffodils above. But I can't. Grass cutting is a WAR and those buttercups are INVADERS. Now, excuse me while I go cut some more buttercup-loaded grass. And find a peanut butter cup. Mathews is well known for its unspoiled beaches, and one beach in particular is well known for its ghosts. Haven Beach, also recently dubbed Festival Beach (although nobody ever calls it that, even though many "festivities" which might be considered festivals occurred there, such as Senior Skip Day in high school, when John A. drank so much grain alcohol that he passed out, belly up, on the beach until the high tide nearly took him out into the bay), lies at the end of a very long, winding road that snakes through what is called Old House Woods. I have a picture of Old House Woods and the long windy road. But I have no idea how to upload more than one picture, and besides it takes a week to upload one picture, so I've opted for a view of the beach and the Chesapeake Bay. There are many legends about Old House Woods and Haven Beach, and all of them involve ghosts. Some say that pirates buried treasure there a long time ago, and some people claim to see a ghost ship sailing through the air, presumably searching for the treasure. I will never forget a Come Here by the name of Hayden. Hayden was, shall we say, different. He was from another country and had an interesting accent. He was also WIDE OPEN as they say around here, meaning that he enjoyed one or fourteen beers on a regular basis. Hayden told me that one night he and another girl were down Haven Beach, sitting in the car. I'm sure they were probably sewing a quilt or discussing the next day's Sunday School lesson, or something nice like that. Anyway, all of a sudden he saw people dressed in what he described as "old timey" clothing. (He not only had a neat accent, he was very deep.) He said they wore ruffled shirts, long jackets, and boots, and they were heading towards the beach, which happened to be where his car was. Here comes the good part: Hayden told me that one of the men approached his car; he rolled down his window and TOUCHED one of these mysterious figures. He said the hand was as cold as ice. No words were exchanged, and the figures kept on walking. 1. Mathews has some beautiful, unspoiled beaches. 2. Mathews has some old legends that are amazingly consistent through the decades. 3. Mathews is home to some of the craziest lunatics that ever walked on the face of this planet. Growing up in rural Mathews, we children had to invent our own fun. There were no video games, no videos, no hand-held electronics, no computers, just lots of riding bikes, making forts, painting shutters pink, pulling up stop signs, toilet papering teacher's houses, riding ponies, going out in the row boat and the usual* stuff like that. Television consisted of ABC, CBS, NBC and PBS. Saturday morning was the only time we saw cartoons, other than H.R. Puffenstuff on Sunday and Does anyone else find the name "PUFFENSTUFF" remotely inappropriate for a children's program, and what, exactly, was the STUFF HE WAS PUFFIN'? *In Mathews, there is one consistent theme: Not much is "usual." Once again, and as usual, I digress. "Painting shutters pink?" you may ask. Pulling up stop signs? Yes. And yes again. But I'll save the stop sign story for another time. The shutter story will go down in infamy as one of The Most Unfair Penalties ever imposed on one of the two kids involved, namely yours truly. My neighbor, Marie, and I were bored. As my friend from Finland would say, because she confuses the English language sometimes, we weren't just bored, we were bored SOLID. So, just like any normal* kids would do, we went next door to my grandfather's barn, looked around for something to do, found a bunch of old green shutters from off his farmhouse, and, as luck would have it, also found some buckets of pink paint. And, just like any normal* kids would do, the natural conclusion we came to was: Let's paint these shutters pink. Excellent, we had a plan and an activity, and boy was it going to be fun. And different, may I add. Anything but usual. *Note: "Normal" in Mathews is a relative term, and is loosely defined as Anything Goes. To this day, I must give myself two snaps and a high five for coming up with such a creative idea. We dragged a couple of shutters to the back of the barn and started painting away. When we were done, we left them leaning against the barn to dry and went back to our respective homes for supper, no big thing. Our job was done, our project complete. We had successfully killed the afternoon that was otherwise destined for boredom. This is where things turned ugly. Somebody found the shutters in all their pink glory leaning up against the barn. Somebody asked my mother if I was involved. With acute survival skills kicking in, when asked, I said I had not done anything and was not involved. Marie, when questioned, confessed all. I was caught in a lie. I hate it when Somebody ruins your fun. I know, I know, I told a lie and I deserved the punishment. There was nothing unfair about what happened. But will SOMEONE please give me some credit for coming up with an innovative, creative, child-friendly activity on an exceedingly boring afternoon? And even though pink is not my favorite color, I thought those shutters were greatly improved. To this day I hate the color pink. And I do not tell lies. I do still get an inkling to toilet paper people's houses, though. And right now, I'm bored. I wish to preface this by saying that I love Bubbas. And may no Bubbas be harmed in the making of this post. Bubbas make the world--OK, just Mathews--go 'round. If not for Bubbas, there'd be no distinction between a true From Here Mathews County male, and any other random male. OK, so that's not true either. Just know this: I do not intend to disparage anyone--bubbas, friends of bubbas, wives of bubbas and--MOST importantly MUMMAS of bubbas. This is merely a caricature or stereotype of the "typical Bubba." I asked for some guest input on this post because I didn't want to sit here all righteous and proclaim that I knew everything there was to know about Bubbas. Guest Contributor Karen had this to say about Bubbas, and she is an expert, because she's a Come Here, married to a From Here, and in her line of work she caters to Bubbas and all their kinfolk. (Yes, I am speaking another language. Do not adjust your tuners. It's a syndrome called LIVED IN MATHEWS WAY TOO LONG). #1. A bubba always has a nickname, usually diametrically opposed to his appearance (i.e. "Slim"). When he dies, this nickname will be prominently displayed in his obituary and perhaps on his tombstone. None of his friends will know his true name. #2. The offspring of Bubbas, male version, always have names ending in "y". Jimmy, Ricky, Bobby, etc. They will be known as "Slim's boy Ricky". #3. The offspring of Bubbas, female version, will be named after a beloved woman in the Bubba's life, usually his momma. They will therefore have names much older than they are. #4. A bubba has an odd number of teeth. Thanks to Karen for that very descriptive input. As a side note, Karen's real line of work should be stand-up comedienne. She just doesn't have time what with her day job and all. But if anyone's looking for a killer of a comedienne, she's the lady. Physical Description: Pumpkin on stilts (Blog Author interrupts Sunshine's description to say, "Hellooooo, I resemble this remark and I am NOT a Bubba. We now return to Sunshine's description, with no more interruptions). Sometimes they look like a Watermelon on bow-legged stilts*. Eye color is usually alien blue with more red than white outside the pupil. Cowboy boots, huge belt buckle. Sunspots. Large bags under the eyes. Hair is anything from Charlie Brown sprigs (always covered up by a baseball cap) to complete redneck plumage resembling mullet, skullet,** or mud flap. ** Blog Author's Question Back to Sunshine: WHAT THE HECK IS A SKULLET?? Can you fry bacon in it? O.K. Hopefully you now have some idea of what a Bubba is. A Bubba is also the salt of the Earth, the best friend you could ever have, someone who will do anything for you (unless the Nascar race is on), and who hopefully will stick around here for a while. They've got lots of stories to tell, and (insert Bubba accent starting now) lemme tell ya summpmm dahlin,' you're just as perty as uh pickshuh an' I don't know much, but I know them Bubbas is as straight as an arrow and as serious as a heart attack. I am convinced there is a correlation between the full moon and Crazy. The fact that the Spanish word for moon is la luna, where luna is just 3 small letters away from LUNATIC, proves that I'm not the only one with this theory. Or it proves something, I'm not quite sure what yet. It does demonstrate my elementary knowledge of Spanish, no? The night I went into labor with my first-born, my son, I spent the entire night staring at that full moon, wondering why in the heck gas pains would be keeping me up for hours on end. Later, when I checked myself into the hospital and heard all the other CRAZIES in there screaming at the top of their lungs, I became convinced that the moon has an effect on mothers-to-be. As well as plain old mothers. And human brain cells. And especially CATS. This morning, the morning after a full moon, I was shocked to see my cat crouching in the bath tub relieving himself as it flowed down the drain. My first reaction (I always think clearly in a crisis) was to turn the spigot on and scare him away with water. In spite of gallons of water pouring down his back, that cat would not stop until he'd finished his business. 2. A cat despises getting wet, but business is business and that takes precedence over any other emergency that may be occurring, including a cold shower. 3. Crazy Cat relieving self in bath tub = Full Moon. We interrupt this boring blog to make the following announcement: Too many equations have been used in the making of this post. There is smoke billowing from the author's ears, and her eyes have officially rolled back in her head. Let's try and finish this thing up with no more math, numbers or algebraic equations. Amen. Of course, it could just be that I forgot to clean out the cat's litter pan, and he was doing the best he could to notify me of my egregious oversight. Maybe I forgot to deal with the cat's pan because of the full moon (or early-onset Alzheimers no doubt made worse by all this atmospheric chaos caused by the full moon). Or maybe we're just both plain along crazy, there is always that. Creeks in Mathews are the size of what most people would call rivers, and the swimming season starts officially now and ends as soon as the first stinging nettle is spotted. Which is probably tomorrow. "Stinging nettle?" you might ask. Yes, stinging nettle. It is what non-Mathews folks would refer to as a "jellyfish," probably dating back to 1600 England or to the Very First Bubba, whichever came first (no harm intended to Bubbas. Or England). Even typing the word "jellyfish" gives me the heebeejeebies, because that is such the wrong word. The right word is stinging nettle. Referring to Bubbas does NOT invoke the heebeejeebies. It's a delicate, complex ecosystem, this Living in Mathews thing. Today, my daughter, her friend Robin, their friend Olivia, and my older son (just along to "supervise" because he has no real interest in associating with younger girls, or being seen close to his mother, or anyone in his family tree, unless they are his friends from school, since he's tending toward TEENVILLE), went swimming in the creek in our back yard. It was a hot day, one where every child and parent at any sporting event will report to bed with stings of the first sunburn. It was also a day full of funnel cakes, snow cones, BBQ sandwiches, crab cakes, french fries, ice cream sundaes, ring pops, and sweet iced tea because it was the Opening Day of Little League, which is the equivalent of the first day of DISNEY in Mathews. (And yes, our Little League sells crab cakes.) This also means that we're all just waiting for the diabetes-induced coma to overtake us so that we don't have to suffer anymore. After a morning of sweltering sporting events, Robin, Olivia and Daughter went directly into the creek, where directly means do not change clothes from sweltering sporting event, go directly into the creek with your clothes on and wallow in the mud. While I fretted about who'd be the first person to cry out in agony after stepping on an oyster shell or worse, glass, they were hootin' and hollerin' with unabashed joy. They splashed and romped and cavorted in the brackish salty water until the cows came home. We don't have cows, by the way. And for now, we don't have stinging nettles either, thank goodness. We do, however, have plenty of Bubbas. I'll never forget the time my dear mother drove past me five times when she was supposed to pick me up from a piano lesson. She does not now, nor did she then, have Alzheimers--thankfully. Which leads me to wonder exactly what IS this middle-aged memory ailment? Because I'm convinced I've "caught" it, and exactly when will it be over? When I was about 12 years old (give or take a few years), I took piano lessons from Mrs. Janice Hudgins, who lived about a mile from our house, down a long, eternally long, dirt road with woods on either side. The road dead-ended to an old farmhouse and one heckuva large Great Dane that was only slightly smaller than KING KONG. My mother, for reasons I have not yet stopped to analyze, used to drop me off at the end of that long dirt road (instead of just driving me to the farmhouse and safely around Cujo) and allow me to walk, alone, down that long road with creepy trees on either side. Clutching my John Thompson's Second Grade Piano Book, I would bravely march with chin up through that forest until I reached the Den of KING KONG CUJO, whose bark alone would rattle my entire skeletal system and cause all 75 pounds of me to crumble into a pile of tears and sweat. All that being said, I would make it past CUJO, knock humbly on the front door, and sit down, petrified, at the piano, where I would pretend to play what I had not practiced the entire week since the last lesson. After the piano lesson was over, please press reverse, and replay the above scenario: CUJO DOG FROM HADES, SCARY WIZARD OF OZ-LIKE FOREST, LONG DIRT ROAD, SMALL GIRL BY HERSELF WALKING TOWARDS THE MAIN ROAD. To wait on her mother. And wait. Then wait some more. Whatever the Forgetting Ailment is that May or May Not be ALZHEIMERS, or even early-onset-that-stage-just-before ALZHEIMERS, I have IT. And I HATE it. Wait a minute. The Wizard of Oz is a great movie. Yes, it is blurry. Yes, it is crooked. Yes, I know, I know. After several weeks of procrastinating, I finally decided to heed the very well-written advice of an earlier commenter on how to upload photos. I took a deep breath, cursed while I tried to find the instruction manual to my camera, cursed after I found it, cursed when I couldn't find all the cords to hook Gizmo A into Slot Z, chewed off 9 fingernails, mopped my brow, cried, and then got down to business. After 14 of the longest minutes I've ever impatiently tolerated, I am pleased to announce that I have finally uploaded a picture from my digital camera. Now, keep in mind that I have not edited it or done anything to it. It is imperfect, and that's fine with me because the point here is that I finally figured out how to upload the darn thing. Unfortunately I doubt I will make this a habit because I simply cannot endure the torture that involves uploading on dial-up internet. - This stretch of highway on Gwynn's Island is my favorite, not only in Mathews but also the world. Of course I haven't seen the world, but that's irrelevant. - I like the curviness of the road, the sign and the tree. - There is some symbolism in the number 45. It isn't my exact age, but in not so long it will be. Now, I've got to clean up the fingernails from my desk. And change shirts. This technology thing is very nerve-wracking. With all due respect to current and former residents of the state of West Virginia, the remarks made in this essay do not represent a personal attack on your lovely state. If I were going to attack, I'd talk about missing teeth and kissing cousins and stuff like that. But I digress. Yesterday on my ride home from work, I received a call from my father informing me that, among other things, he had finally removed the satellite dish from in between our houses. And when I say satellite dish, I mean one of those now-defunct Monstrosities from Circa 1983 that stood 40 feet high and looked like something off the Starship Enterprise. This symbol of outdated technology currently serves as the West Virginia State Flower until they receive further notice regarding the latest cutting edge technology, such as we now have dial-up internet...and stuff. And when I say "they" I think I mean the state of West Virginia, but I also mean ME, who lives in the next state over; way over. And who is equally clueless with regards to technology, including digital cameras, instruction manuals, curling irons, coffee makers, and satellites, whether cutting-edge or defunct. In the Era Before Cable, this Great Big Satellite Dish was all the rage. We were the first ones to have it. And the last ones to take it down. While it is good to know I no longer have to worry about me, my husband, my parents or my children becoming ENSNARLED in the web that was that satellite monstrosity, I also must confess that there is a huge, gaping hole in the space between our houses now (read: ours and my parents') that requires filling. Maybe we can bring ourselves into the next generation and put in one of those newfangled, rural food courts. Also known as a garden. Four years ago this week, in a tiny wooden chapel in the foothills of the Great Smokey Mountains, I married a man who said he'd walk through fire for me. Little did he know that the smoke and fire he'd be walking through were towards the dinner table, after I'd burned yet another concoction. Speaking of smoke, there was the time I flooded the tractor inside the garage to the point that I set off every carbon monoxide detector east of the Mississippi. You see, it was the first time I'd started the tractor since last summer, and I forgot which handle was the GAS and which was the CHOKE. (Speaking of choking, my throat is still raw from inhaling those fumes.) And gosh darn it, when you're already stressing about all the smoke you're inhaling and the fact that the situation is getting worse because of the confusion with the knobs, those carbon monoxide detectors are just enough to put a person into cardiac arrest. Another time he walked through fire for me was the time or three I accidentally knocked over a lit candle during a romantic supper (a supper that I had managed not to burn). When there is no fire extinguisher in the house, or rather, you can't remember where you put it,this really is a test of what a person is made out of. He's made of True Grit. I'm made of True Spit. Yet another potential disaster occurred right after Hurricane Isabel. We'd been hooked to a generator for approximately three of the longest weeks that ever felt like fourteen years. After power (or, as they say around here, "current") was restored, the first thing we turned on was the Big TV. I walked away for a while and BLAH BLAH BLAH THAT HAS SOMETHING TO DO WITH INCORRECT USE OF GENERATOR AND/OR EXISTING ELECTRICAL SYSTEM YADA YADA, the whole TV set went up in flames. There was lots of smoke, a few embers, and lots of tears. I loved that TV set, Rest in Peace. Yes, in the Smokey Mountains (irony is not lost on me with the "smokey"), he said he'd marry me for better or for worse, in sickness and in health, as long as we both shall live. He said he'd walk through fire for me. I don't think he realized just how many episodes of fire there would actually be, but I'm glad he's still here as my personal on-site Fire Department. Happy Anniversary, Fireman. I love you. Last but not least, there is....(insert sound of angels singing)...Dollar General. As a child, I secretly loved the Dollar General but was too embarrassed to be caught DEAD going into it. In my twisted little world, I thought Dollar General was for poor people (hello, we weren't exactly wallowing naked in cash) or for people with no class (I might have resembled that remark). Or common sense (ditto). This was quite the conundrum because I actually did a large part of my clothing shopping at Dollar General (after donning a hooded jacket, dark glasses and moustache to slither in undetected). I loved all the comfortable polyester that was not only cheap, but super dirt cheap. And tacky, as in Do Not Pass Go, Go Directly to Fashion Prison...for life. Looking back, none of it makes sense. I didn't want to be seen walking into Dollar General yet I wore their clothes to school every day. And most people with two functioning eyeballs could tell where the polyester slightly irregular pants with an elastic waistband that lasted exactly two weeks came from. So, the secret was out. Now that I've matured (read: don't give two hoots about what anyone thinks and in fact go out of my way to prove it), I openly ADORE Dollar General and go there as often as I can without being arrested for loitering. You can buy just about anything there: milk, energy drinks, batteries, nurses' smocks (I'm not a nurse, but it is comforting to know that if I were one, I could buy uniforms there), silly putty, salt and pepper shakers shaped like farm animals, litter pans, fresh, clean Haynes underwear, flip-flops (or ship-shops as a friend calls them) Pantene shampoo, reading glasses, hair extensions, kitchen sinks and best friends for life. OK, so they don't sell hair extensions. Or kitchen sinks. But you can get all the rest there and still have plenty left over for your next shopping excursion. At the community yard sale. Donk's is a mixture of Hee Haw meets Real Talent with a side order of Eccentricity, heavy on that. Next, the four talent contestants did their thing. The first poor lady started off strong but then couldn't remember the words to her song and left the theater in shame and humiliation, all self-inflicted. I wanted to run and give her a hug but feared she'd call The Law on me. The second act, I'll call him Guitar God, was a young boy who played the guitar. I thought I had died and gone to heaven. I have NEVER heard a guitar played as well or in that style before. Ever. And while it is true I do not get out much, I don't know how anyone could disagree with the statement that he's a Guitar God. A sheer genius. The third act was a young couple singing a duet. They came in second place and did reasonably well. The fourth and final act was a Mathews native who also managed to forget a few words but who gets an A for effort. Guitar God won, and I am sure y'all will be reading about him in years to come. And if you ever have the chance, give ole Donk's a try. It really is good, clean fun with some great music, lots of heart and plenty of corny jokes. * The emcee at Donk's said that when Dolly Parton gave him a hug, it was the two best things that ever happened to him. ** What did the Mamma Bullet say to the Daddy Bullet? We're gonna have a BB. Today I ran my very first 5K and thought I was going to die, except I didn't. And it felt great. Except for the Near Vomiting Experience at the end. And the fact that the string holding my shorts up came out and started dangling down my leg. And my shirt, which seemed long enough the last time I wore it, was not long enough at all , so my belly was hanging out . I was using one hand to hold up my britches and the other hand to wave down the medical personnel after I crossed the finish line. - It was in honor of Dr. Bobby Stewart, a local doctor who succumbed to cancer and left behind a wonderful, beautiful family, who were there in full force today. - I had not really trained properly (or at all?) for a 5K. I walk and jog sporadically, but until today I had not run 3 miles +/- and was convinced I would resort to walking. - I did not walk one bit. -It was an achievement, plain and simple. -I had not eaten in 24 hours due to having a bad day yesterday. I might have had a glass or two of wine. Might, I said. -My clothing would not cooperate. -I came in 42nd. Yes, 42nd. Out of 52. But at least I did not throw up at the finish line where they were taking pictures. I'm afraid they did get a shot of my belly hanging out and the string dangling down my leg though. I may not be artistic or musically gifted, but I swear I know a good photograph when I see one, and today I went out with my camera and shot the most beautiful pictures of old architecture on Gwynn's Island you've NEVER seen. 1. I have dial-up internet, and to upload anything takes an Act of Congress and the patience of a dead person. 2. If I had high-speed internet, I have the attention span of an Alzheimers patient and cannot retain directions, will not be able to put Step 1 + Step 2 in any sort of order that means an uploaded photograph, but will break out into a cold sweat and allow anyone else to take over. So 3. If I should CROAK, aka KICK THE BUCKET, please know that on my digital camera there are pictures of INCREDIBLE Mathews mid-19th century architecture, that would make Ansel Adams wish he'd lived here. OK. So I am not Ansel Adams. Or Wayne Newton. But give me a camera and a microphone and I garonTEE (yes, I know the correct spelling) you'll be impressed. At my expense, of course. With apologies in advance for using a foul word—in the opening sentence no less--on what should otherwise be a G-rated blog. My father often says if it weren’t for the Come Heres, we’d still be sh&tting in the ditch. Come Heres - You moved here of your own FREE WILL and purposely selected Mathews as your residence. (Please consider scheduling an appointment with your psychotherapist. AT ONCE.) You came from some place far, far, away. A place with fine dining, places to shop, bike paths, walking trails, indoor plumbing and non-lethal drinking water. 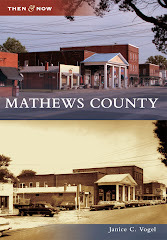 From Heres – You were born in Mathews and/or lived here the vast majority of your life. You tend to be suspicious of the Come Heres because they’re City Folk who might try to change things, such as people sh&tting in ditches. From Heres generally have strong family ties to the area, and it isn't unusual for their family tree to be traced back several hundred years. Most From Heres know one another, and if they don’t, they will talk it through until they find another From Here they both know. Then everything is right with the world. As you can imagine, there can be friction between these two groups. The From Heres really don’t think the Come Heres understand much about living in Mathews. The Come Heres can’t believe the importance the From Heres place on being from Mathews. When a Come Here tries to open up a bank account or even write a check at the grocery store, they’re asked to show birth certificate, passport, photos of all children, and a complete genealogy or family tree in the hopes that there is someone, ANYONE, related to them with a valid Mathews connection, where connection = From Here. If not, then the Come Here better KNOW a whole bunch of From Heres. They must state the names of these From Heres, their relationship, how long they’ve known them and how far from them they live. When a From Here opens a bank account, they walk in, say hi to every single person in the bank, catch up on local gossip, make the transaction and promise to bring by an apple pie later on. No identification required. As time passes by, however, I’ve noticed that the Come Heres seem to be taking over, and the From Heres seem fewer and farther between. This is not a bad thing, just an observation. Come Heres can be good. At least we’re not sh&tting in ditches anymore. Note: This article will appear in the May/June issue of Pleasant Living magazine, available FOR FREE at your local convenience store underneath the stacks of yesterday's newspapers. If you stand on your head, you'll see it. This was for a Readers Write exercise on the topic of Friends. Unconditional love earns the dog the title of man’s best friend. I beg to differ. All of my friends provide unconditional love and support, and none of them are dogs. Of course I’m not a man either, but I digress. I’ve known my friend Alda since the very first day of school at age 5. Nervous and unable to make eye contact with anyone, I hastily sat next to her on the bus. With the wisdom and confidence of a soul much older than her 5 years on this planet, she immediately noticed my unease and began chatting away, telling me stories about her life and making me laugh. Almost 40 years later she still has the ability to make me laugh no matter what drama or tragedy or life event is doing its level best to drag us down. On yet another first day of school, I nervously unpacked all my worldly belongings in my college dorm and, with the confidence of a church mouse and the social skills of Rain Man, I paced back and forth and around in circles in our suite. Iris, an extrovert, immediately came up and started talking. In an instant, I had a friend who calmed me and made me feel okay, even though she herself had been flung into this new environment. Almost 25 years later, she still has the innate ability to calm me down. Another friend, Kathy, I met when our sons started daycare together. As we watched all the Perfect Mothers in their black heels and tailored suits effortlessly drop their children off, we were the only ones on the sidelines wringing our hands, feeling guilty, feeling inadequate. Over the years, our (mostly distorted) interpretations of life and its events have brought us even closer together. She makes me laugh, I make her laugh, and we see things eye to eye. That those eyes desperately need an optometrist is entirely beside the point. There are several lessons to be learned here. First, I clearly hate change. Second, evidently I don’t like first days of school. Third, I don’t care for dogs much, but I do like cats. Most importantly, fourth: I cherish my lifelong friends who make me laugh, and who support me through thick and thin. On some cellular level, I was intended to be musical, I just know it. I love music, I love singing, and I watch Dancing With Stars in absolute awe and envy. I’ll spell out the clear-cut evidence as to why I should be musically gifted, but in the meantime, my cellular-level musical desires are entirely squashed out by Reality. In other words, I can’t carry a tune in a bucket. 2. My mother not only played the piano well, but she sang in a musical group called the Bobby Soxtet (a very clever name, assuming you’re old enough to know what bobby socks are. If not, excuse me while I go pluck the gray hairs from my scalp and put the assisted living community's number on my speed dial.) This group sang, with much acclaim, on a local radio station. 3. My father played the drums in several bands, one of which, the Dynatones, recorded an LP and played up and down the East Coast in the 1950’s. He also played in a country-western band that somtimes grew a wild hair and dabbled in disco. For those of you unfamiliar with disco, or LP's, this is the equivalent of saying that THE AUTHOR OF THIS BLOG IS AGING AT WARP SPEED AND NEEDS TO GO LIE DOWN BEFORE SHE HAS A FULL-BLOWN MID-LIFE CRISIS with a side order of UTTER AND COMPLETE MELTDOWN. 4. As stated elsewhere on this boring blog, Wayne Newton zzzzzzzzzzzzzzzzz …..ooops! Wake up! Yes, yet another Wayne Newton reference, but you can get through it…..is somehow related to me on my mother’s side. Although this is not something we generally brag about (even though I mention it incessantly here,) it does prove that somewhere in my family tree there is someone who has earned fame, infamy and notoriety in the musical world. Nevermind that it's a world of lounge singers, tawdry venues and cheap buffet eateries. 1. As much as I like to think I can sing, I can’t. 2. As much as I want to be able to dance, I can’t. 3. The extent of my piano repertoire is as follows: Chopsticks and The Entertainer. I really do hope the Assisted Living Community has karaoke, though. In spite of what today’s title suggests, I am not going to discuss what is growing in my refrigerator at this very moment. Instead, I’d like to take a moment to discuss projects assigned to elementary school children. My feelings on this topic begin and end with one short word accented by multiple punctuation marks and accompanied by a prolonged, labored scream: WHY????!!!!!?????!! My son’s Jamestown fort made entirely of wooden clothes pins was nothing short of torture. His science project showing how different color light bulbs can affect the growth of seeds (that would not thrive if Martha Stewart Herself had planted them in soil from the Garden of Eden) was Most Unusual Punishment. Tomorrow my daughter has a science project due. And it is now Tonight, the Tonight which immediately precedes tomorrow. In a few short hours, tomorrow will be today. Naturally, we’ve known about this project for over six weeks. Naturally, we are not even close to being finished. And when I say we, I mean SHE, but I also mean WE because I am stressing about it MORE than SHE is. I’ve just come from reviewing her hypothesis, checking her procedure, assessing the validity of her conclusion and questioning our sanity. And when I say OUR sanity, I mean MINE. I can’t wait for tomorrow to be yesterday. Believe it or not, grass cutting season starts as early as February in Mathews and ends exactly on this date: NEVER. Because Mathews grass grows like the Amazon Jungle on Steroids, a tractor is essential to keep it--and one's sanity-- reasonably in check. Reasonably, I said. Because folks spend an average of 36 hours per DAY on the tractor, the chances of a mishap increase. Exponentially. Below are but a few Tractor Mishaps from past cutting seasons. 1. Father, cutting a steep embankment, flips tractor over into creek. Where creek = large body of water equivalent to the Potomac River, and where Father sees life flash before his eyes (and winces). 2. Mother, Age 60-something, riding a "fixer upper" that my Father had re-engineered (using Legos and Tinker Toy parts), loses complete control when mower does not respond to brake, clutch, gas, emergency brake, or prayers to God. Mother decides to ram tractor into huge cedar tree to get it to stop. Tractor decides the fun is not even close to over and, upon slamming into tree, goes into REVERSE and even more out of control. Mother sees impending death when tractor, now going 35 miles per hour in reverse, picks up speed and begins heading towards clothes line AND car. Mother dives off tractor. Tractor runs over top of her. Mother gets up bruised, battered and shaken but thankfully ALIVE to tell the story...regrettably to her gynecologist the next day at her regularly scheduled appointment. Because the mower deck managed to impart a bruise the size of Texas right near where the doctor was checking. 3. Father's Friend, approximately 60-something years old, has a few drinks and decides to take his tractor for a spin around his back yard (there's not a lot to do around here). Determines that tractor can definitely make it over a very narrow bridge going over a ditch. Tractor does not live up to Father's Friend's (impaired) judgment. Tractor starts turning over into ditch, Father's Friend somehow does a COMPLETE flip off tractor. Judges give him a perfect 10. These are but three of several hundred tractor stories. I would write more, except I've got to get back to the Amazon Jungle. On my John Deere, wearing knee and elbow pads and a safety helmet. Instead of expounding on the many reasons why Fools Day should not be limited to the month of April, I will tell about the most memorable April Fools prank in my time on this planet. In first grade, Pretty Page What's-Her-Name was finishing up her lunch. In those days, a warm bologna and cheese sandwich was considered culinary excellence, and lunch boxes were either tin or paper, as in bag. Dessert was not something we first graders ever brought to school, but today, April 1, Pretty Page pulled out a Milky Way bar. The entire class stared at her in awe and envy. We wanted a Milky Way bar. Or seven. She s-l-o-w-l-y unwrapped the delectable chocolate candy. In super-duper slow motion she opened up and raised the sugary loaf of HEAVEN to her mouth. We all waited in anticipation as she took that first delicious bite of caramel bliss. Imagine our surprise, which shifted to horror, then back to surprise, and then to the entire classroom breaking out in uncontrolled hysterics when she bit down on a block of wood that her exceptionally clever mother had disguised! This Mother Whom I Greatly Admire Yet Never Met even went so far as to write Happy April Fools Day on the block of wood. Pretty Page Whats-Her-Name has probably forgotten all about that incident. But until I stop drawing a breath and/or my much-obsessed-about, inevitable Alzheimers finally does set in, I will never, ever forget the look on her face that day.